Contact Person: Mr. Sunny Mobile :+973 39595572. Selling sea water fish, fresh water fish, fresh water plants, Aquarium tanks & accessories at competitive price. Also undertake new Aquarium projects for Residence, Hotels, etc. & Cleaning & Servicing of Aquariums. Selling fresh water fish, fresh water plants, Aquarium tanks & accessories at competitive price. Also undertake new Aquarium projects for Residence, Hotels, etc. 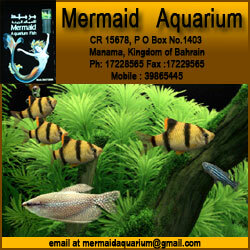 & Cleaning & Servicing of Aquariums.